You can make your own name puzzles with plastic bottle caps and recycled containers. Use the puzzles to teach kids to recognize and spell their names, plus use them for many different literacy activities. All the preschool teachers that I know are masters of collecting and re-using stuff. Are you guilty of saving every toilet paper roll, paper towel roll, plastic container, bubble wrap sheet, and bottle cap that you see? You can use some of that “stuff” to create name puzzles and name activities for your home or classroom. Currently, I have a collection of bottle caps in my kitchen. Milk caps, soda bottle caps, water bottle caps, Gatorade bottle caps – I also save little containers with lids. Chip containers, ice cream containers, deli containers. I save them all. I like to use all of the stuff for all kinds of activities. Today, I’ll show you how to make your own name puzzles with them. Learning to recognize, spell, and write his or her name is an important objective for a child in preschool. Using name puzzles is a fun way for a child to learn how to write his or her name. If your kids have already mastered their names, you can use the idea to make sight word, CVC word, or thematic word puzzles. It may seem like you need A LOT of bottle caps for this activity. If you put task your parents, friends, and family to start saving them…you will have enough in no time. If you don’t want to save and sort bottle caps, inexpensive poker chips work well for this activity too. To make your name puzzles, all you have to do is neatly write the letters of a name on the top of plastic bottle caps. That’s it….easy peasy. If you want to make them look all neat and fancy, you can also use the name puzzle resource from my TPT store to print letter circles that you can apply to the bottle caps. You can use the permanent marker to write kids’ name on the top of each container. You can also use the picture template and name square template from my name matching activity article to make your own labels. A small photo on the top of each container will help kids quickly identify each puzzle. 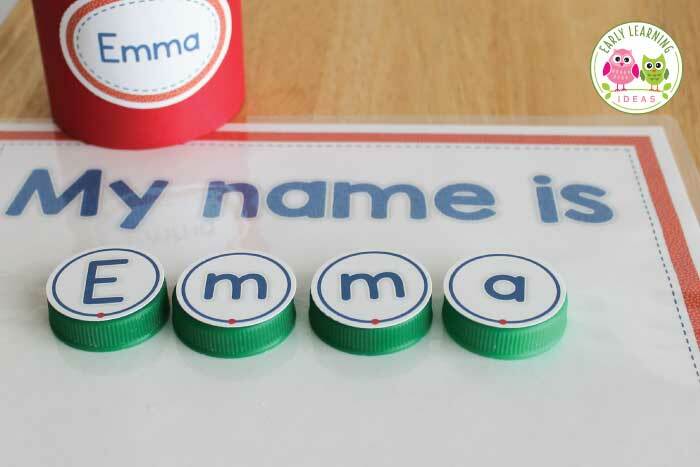 A printed name on the bottom of the container can be used for reference until kids can place the letters in the correct order. The name puzzles resource in my TPT store does include templates to create name labels for a variety of containers. Whether you make your puzzles with or without the template, I think that you will find them to be a great addition to your class. Here are a few ways to use the puzzles. At the beginning of class, ask each student to find his or her puzzle and put it together on a puzzle mat. Children can put name puzzles together on a name mat or dry erase board. Add a dry erase marker to the center so that kids can practice writing their names. Children also love doing this activity with the names of their friends. Ask a child to count the letters in his or her name. Count the letters in a friend’s name. Which name has more letters? How many more does it have? Which name has fewer letters? After putting two name puzzles together, ask children to find letters that are in both names. How many letters do they share? Do the names start with the same letter? However you choose to make them, I think that you will find that kids love the puzzles. So, tell everyone you know to save bottle caps for you. In no time you will have enough caps to make a set of name puzzles for your class. If you are looking for additional hands-on name activities, check out the following resources in my TPT store.